If you're not too particular about fried food, this is definitely worth a try. Then again, let's face it, if you're eating Indonesian Padang food, you can't be too health-conscious. Most of the dishes are fried or at least had their spices fried and let's not even talk about the use of coconut milk in many of the dishes. I love vegetables and so this dish was also a personal favourite of mine. Its essentially Tapioca Leaves stewed in a lightly-spiced Coconut Milk gravy. 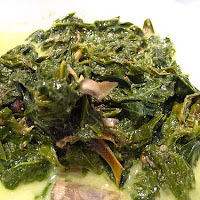 The cassava leaves were soft from the stewing process but had absorbed the flavours of the spices in the gravy. Its a perfect complement to steamed rice and is a MUST-TRY!